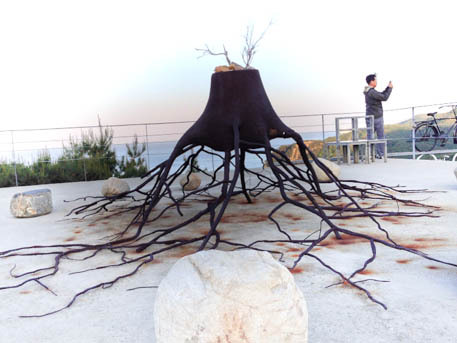 Strengthen your center of intuition and creativity at Haslla Art World, just north of Gangneung City, high atop a cliff overlooking the East Sea. Salty sea air blows through the pine branches; wispy fog drifts around the base of exaggerated fertile female forms, stark bronze lines cast against a canvas of variegated blue hues where the sky and ocean mesh. A silver suited man teeters forward on the roof edge of the glass building just beyond the hill, opposite the life-size red-wire mammoths perched on stilts. Looking down, stepping-stones of colored glass mark the path. Every shift in your field of vision presents something new and unexpected. Exploring this 61-acre art community, with its botanical gardens, outdoor interactive sculptures and themed landscapes, functional art studio, hotel, and cafe, you will encounter a hodge-podge of sights, sounds, smells, and textures. There’s an art style for anyone’s tastes, with exhibits displaying contemporary works by Haslla Art World’s owners and students in residence. Throughout the year, the institution hosts symposiums, workshops, and performance art festivals. Experiential programs enable visitors of all ages to get hands-on creative. The hotel itself is a work of art, a multi-colored glass and steel structure where the sky and sea are everywhere visible. The focal point of the 24 guest rooms is an oval shaped bed designed to evoke the sensation of sleeping in a mother’s womb. Outside, landscapes are transformed into interpretive works of art: Time Square traces the celestial equinox; in the Sky Observatory, art extends into the Z-axis beyond the cliff edge; a boardwalk winds through Pine Tree Garden, where nature steals the show. Plan to spend at least half a day to thoroughly tour the museum and hotel, enjoy the café, and discover all the treasures in the outdoor sculpture park. If you can capture a sunrise or sunset, even better! 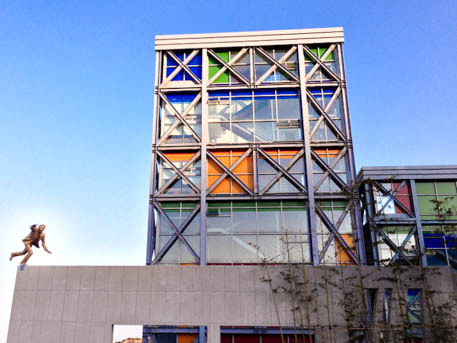 Haslla Art World is open year-round, with a $10 entrance fee. Getting Here: From PyeongChang, take the KTX shuttle or Express inter-city bus to Gangneung Intercity Bus Terminal. Take city bus 111, 112, or 113 to Haslla Art World (about a 30 minute ride).